It’s a big day for MEG. No, not Meg Ryan, though we are excited about her engagement with John Mellencamp. We are talking about monoethylene glycol which just got bigger with a new demo unit in operation. Brazil-based Braskem and Denmark-based Haldor Topsoe just commissioned their pioneering demonstration unit, located in Denmark, for the development of monoethylene glycol (MEG) from sugar. Their innovation for renewable plastic made from sugar instead of traditional fossil fuels has been getting attention and this news marks a decisive step forward towards the goal of producing renewable MEG on an industrial scale. In case you didn’t know, Braskem is America’s largest resin producer and a world leading biopolymer producer. Haldor Topsoe is a global leader in catalysts and technology for the chemical and refining industries. Announced in 2017, the cooperation agreement between Braskem and Haldor Topsoe focuses on developing a new technology for converting sugar into MEG at a single industrial unit, which reduces the initial investment in production and consequently makes the process more competitive. So this news is like a marriage made in heaven. And their cute little baby is named MEG. Except MEG is big. So what’s so big and great about MEG? MEG is an important raw material for industrial applications – like for making polyester (PET) resins, films and fibers. You know, the stuff that’s used all the time in textile and packaging industries, and especially for making plastic PET bottles. According to Braskem, the global market for MEG currently is at around $25 billion and this joint bio-based MEG plant is a major step forward in improving the sustainability of PET plastic packaging and reducing carbon emissions. 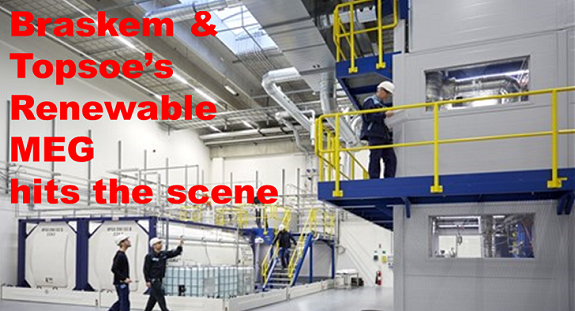 The demo unit built in Denmark has annual production capacity of hundreds of tons of glycolaldehyde, a substance that is converted into MEG. The goal is for the plant to convert various raw materials, such as sucrose, dextrose and second-generation sugars, into MEG. Currently, the compound is made from fossil-based feedstocks, such as naphtha, gas or coal. Starting next year, clients will receive samples to test in their products. “Haldor Topsoe is a global leader in catalytic solutions and is driven to maintain its leadership in the renewable energy industry. We are pleased to embark, together with Braskem, on the next phase of the validation of the MOSAIK solution for producing biobased MEG. Our goal is to show that innovative catalytic technologies can make chemical products from biomass a commercially attractive option,” said Kim Knudsen, executive officer at Haldor Topsoe. “The process for developing renewable MEG in partnership with Haldor Topsoe represents a major advance in competitiveness for Green PET. The partnership strengthens the leading role we play and adds value to our I’m green™ portfolio, which already features Green Polyethylene and Green EVA, both made from sugarcane. It also will further corroborate our vision of using biopolymers as a way to capture carbon, which helps to reduce greenhouse gas emissions,” explained Gustavo Sergi, director of Renewable Chemicals at Braskem. MOnoSAccharide Industrial Cracker – or MOSAIK – is a solution for cracking of sugars to an intermediary product which can be further converted to MEG or other biochemicals, such as methyl vinyl glycolate or glycolic acid, using Haldor Topsoe’s patented processes and catalysts. Innovation Fund Denmark has co-financed the development and upscaling of MOSAIK. Unlike the process to create a baby or the love filled Valentine’s week, making MEG is often about breaking things down, not joining them together. And Braskem hasn’t been the only one working on MEG. As reported in NUU in March 2018, France-based CARBIOS has demonstrated an enzymatic depolymerization process for polyester terephthalate polyester fibers from textile waste. The process broke down the material into its original monomers: terephthalic acid and monoethylene glycol. CARBIOS says that polyester accounts for half of the overall fiber market. “Each year, 43 million tons of PET is produced for the fiber market, compared to 15 million tons dedicated to the production of plastic bottles,” the company says. Even Avantium is in on the action with their retaking of full ownership of its YXY plants-to-plastics technology through the purchase of BASF’s shares in the Synvina joint venture. Avantium’s renewable chemistry programs include the Mekong technology, which transforms sugars into plant-based monoethylene glycol (MEG) used in the production of materials including renewable plastics and polyesters. From Braskem’s sugarcane-based EVA used in flip-flop sandals to the first polyethylene of renewable origin to be produced in the world that is applied to coffee pillow packs and their ‘I’m green’ polyethylene (PE) biopolymer, Braskem sees the huge market for biochem and bioplastics and are taking action on it. While still a petrochemical company, they see the way of the future and this demo plant is a step towards the alternative biobased solutions path. We are sure there is more to come from them and others on MEG in the future.